Alternative rock fans, are you hyped for the very first Disrupt Festival?? This all-new touring roadshow will feature performances from The Used, Thrice, Circa Survive, The Story So Far and Atreyu!! Get ready to rock at the Xfinity Center on Friday 5th July 2019 – tickets on sale NOW and expected to disappear FAST!! Get ‘em while they last! Rockstar Energy Drink presents an all-new touring festival, featuring performances from up-and-coming artists as well as rock music’s biggest stars. Unlike most other festivals, only one band will perform at a time at Disrupt Festival, meaning there will be no times where you have to choose between your two favorite bands due to lineup clashes – you get to see ‘em all!! What’s more, Disrupt festival offers not just music, but a special immersive all-day experience where fans can interact with new lifestyle brands and pop-up activations. The very first annual Rockstar Energy Drink Disrupt Festival will feature performances by The Used, Thrice, Circa Survive, The Story So Far, Atreyu, and MORE – that’s one way to kick off an all-new touring show in style!! No modern rock music fan is gonna want to miss this epic event – make sure you don’t!! 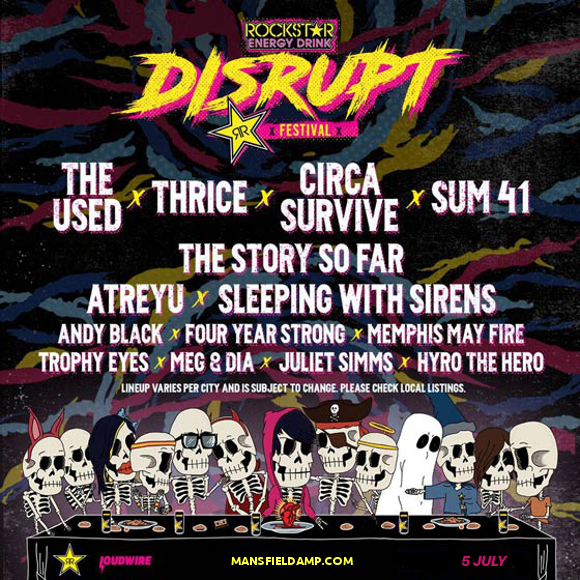 Hit the “Buy Tickets” button NOW to get your tickets to the inaugural Disrupt Festival with The Used, Thrice, Circa Survive, The Story So Far and Atreyu on Friday 5th July 2019 – it’s going to be a show you’re not likely to forget in a hurry!